Air101: Swoop swoops in for first flight. Swoop swoops in for first flight. 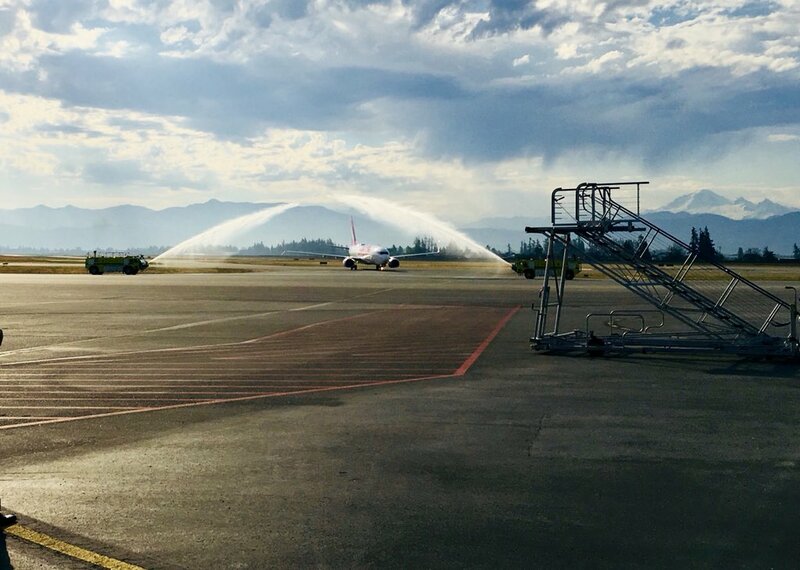 The new ultra-low-cost-carrier Swoop has launched its flying programme with its first flight from Hamilton to Abbotsford which was warmly greeted with a water cannon salute. The airline also celebrated another amazing milestone of already reaching 100,000 tickets sold, which is quite amazing. The airline is flying new 189-seat Boeing 737-800NGs of which it currently has two, but is expected to increase fleet size to 10 aircraft by the end of 2019. WestJet's Swoop will mainly operate domestic flights in Canada and routes include the following destinations Abbotsford, Edmonton, Winnipeg, Hamilton, and Halifax as it starts, with more destinations coming online as it receives its new aircraft. The carrier says its fares will be on average 30-40% less than the typical national airlines.